“Then I saw her face, now I’m a believer,” sang Nam Nguyen, a guitar-playing fairy in A Midsummer Night’s Dream, one of William Shakespeare’s most well-known comedies. The Victoria College Drama Society (VCDS) opened its 2018–2019 season on Thursday night with a dreamy performance of A Midsummer Night’s Dream. Directed by Abby Palmer, the play was adapted to suit a contemporary audience and ran for 2.5 hours with a 10-minute intermission. Some of Shakespeare’s original text is still used, but much of the convoluted words and language have been edited and translated into modern English. More interestingly though, is that Palmer’s adaptation is set in 1968 America. 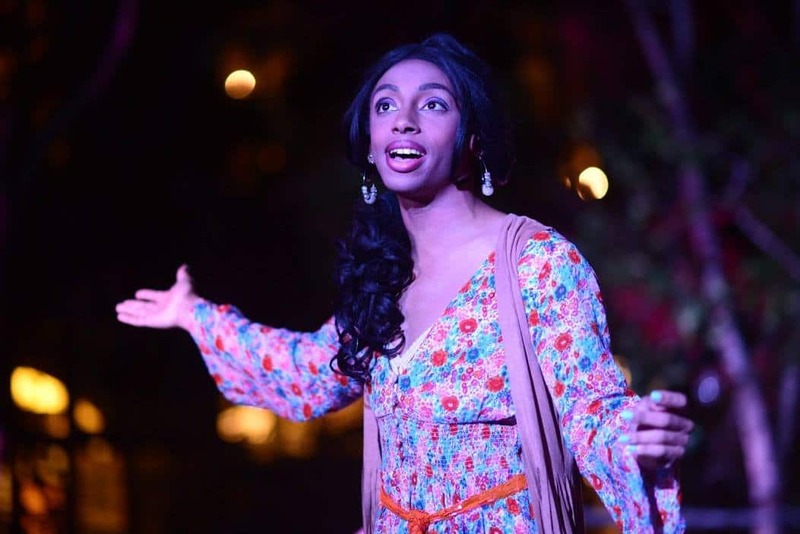 The new setting is brought to the forefront with the inclusion of swapped gender roles, LGBTQ+ people, and people of colour, as well as snazzy costumes, lively singing, and dancing. In multiple scenes, characters dressed in bold miniskirts, platform heels, and tie-dye break out into popular songs like the ‘60s hits “I’m a Believer” and “Stand by Me.” This specific directorial adaptation is more relevant than ever in today’s political climate of social movements and regressive leadership. Midsummer focuses on four interconnected plots: the relationships between the characters of Hermia (Eiléanór O’Halloran), Lysander (Rachel Leggett), Helena (Mitchell Byrne), and Demetrius (River Oliveira). Against the law of Theseus (Devon Wilton), Hermia and Lysander intend to get married, while Demetrius attempts to win over Hermia, and Helena tries to win Demetrius. In the forest and the realm of Fairyland, Oberon (Wilton), king of the fairies, and his assistant Puck (Nicole Eun-Ju Bell) concoct a special potion to set things right among the couples. Meanwhile, a group of hippie actors rehearse a play of their own that they hope to perform at Theseus’s wedding. Things go wrong and chaos ensues, but everything seems to have a funny way of working out in the end. This hilarity balances the commotion of the many different and deep themes and scenes in the play. Characters in serious conversations in the foreground are met with amusing moments between characters in the background. In one instance, Hermia and her father argue over her arranged marriage to Demetrius while Lysander and Helena secretly fight behind them. The audience was constantly having a laugh at these actions and other witty one-liners. Visual elements helped to bring the dream world even more to life, with a colourful set design, hilarious sound effects like the characters’ car driving behind the audience, and lighting effects that featured prominently throughout the show. The play was performed at the Emmanuel College Quad, which added to the ambience and fit seamlessly with the forest scenes on stage. Most of the seating was on tarps on the grass, although some chairs were provided. Audience interaction was a large part of the show. It was a bit startling when characters suddenly walked up and down the aisles, and even across the tarps of people on their way to the stage. Puck spoke directly to the audience several times throughout the show, as if talking to a friend. For a small outdoor theatre, this truly enhanced the intimacy and sense of community, especially in the chilly fall evening. Overall, the musical performances of the cast and the modern dream world setting made for a magical night.